FPT18-I series intelligent lightning protection component tester is used to measure the performance parameters of various metal oxide varistors (MOV) and Gas discharge tubes (GDT). The tester has high-voltage short-circuit protection, over-current protection, high-voltage presetting, range adjustment, self-inspection function, measurement range of spark voltage U1mA: 0~2000V, measurement range of leakage current: 0~ 499.9μa, good repeatability. It also has the function of setting up qualified range and judging and screening qualified products. Widely used in lightning protection component, surge protector and other over voltage protection components performance parameters test. 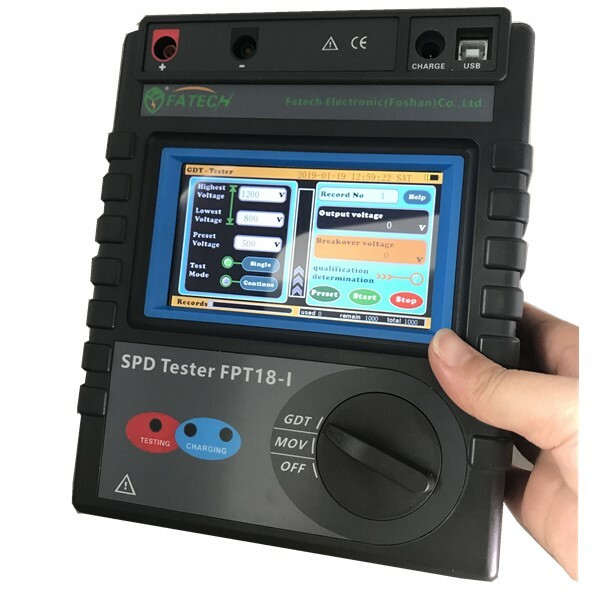 The instrument adopts finger touch color screen, direct function, one-button measurement, easy and fast operation, with excellent test stability and anti-interference ability. At the same time, the meter is build in a large capacity rechargeable lithium battery, and with data storage, qualified judgment, automatic shutdown, USB data upload and other functions. 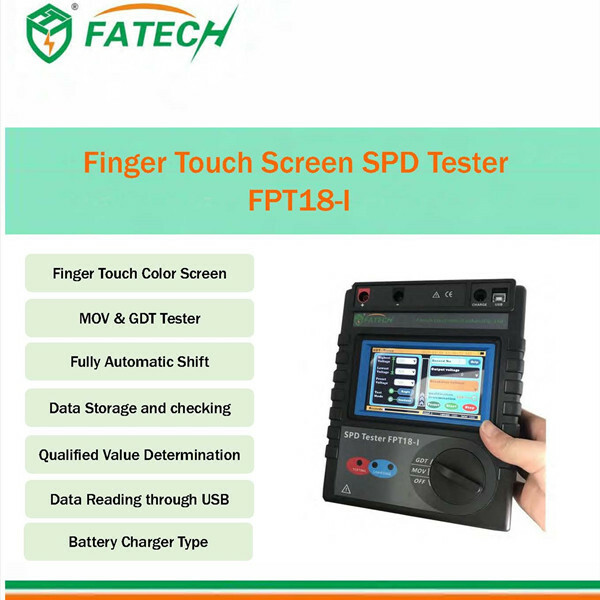 FPT18-I series lightning components tester has shockproof, dustproof, moisture-proof structure, the whole machine is beautiful and durable, adapt to bad working environment. It is the commonly used necessary instruments in the lightning protection, power, communication, electromechanical installation and maintenance, lightning protection components manufacturers, and industrial enterprise departments. Single mode: no preset needed, for a few test. Continue mode: preset needed, for a batch test. USB interface, test log record data upload computer, can be exported to Excel format. Battery power indicator shows that the battery power is pressed down to remind timely charging. Building D7, Guangdong New Light Production Base, Luocun, Shishan Town, Foshan City, Guangdong Province, China. Our main products are TUV certified according to IEC61643-11:2011, all of the products are CE certifed according to EN61643-11:2012, EN50539 and EN62561. Some products have achieved the test report of accredited laboratories with CNAS and ILAC, according to GB18802.1:2011. © Copyright 2019 Fatech Electronic CO., LTD. All Rights Reserved.